Hello there! One of the great things about blogging is getting to interact with amazing people. Recently, we got acquainted with fellow game designer David Dostaler. David is the designer of a roleplaying game called Challenger, which you can read about here and is available for free at DriveThru RPG or Amazon. After reading through his game, we decided to ask him a few questions about the game. We are pleased to share with you what David had to say. Enjoy! 1. One thing I noted was that you do not have the Game Master roll dice. I personally like this decision, and I want to get an idea of what you feel this adds to the game, and what, if anything, is lost. What led to this design choice? Basically it just started out as a way to 'speed up' game play. 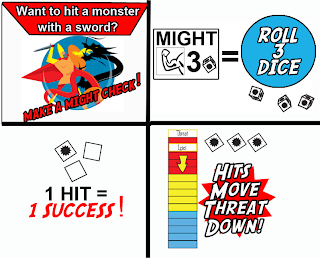 With no dice rolls for monsters to worry about the game is immensely fast and simple. I know this also raises a heck of a lot of questions like "Well then, how 'do' you roll monster attacks?". Don't worry, all is taken care of in the full Challenger rules which explain it much better than I could here. I would like to say there was an unexpected benefit to this 'speeding up' of the game. All challenges are determined by the players response to them. For instance: in most RPGs the GM will say "Ten ninjas attack you, roll for initiative". In Challenger the GM will 'always' say, "Ten Ninjas jump out at you, swords gleaming. What do you do?" This may seem like a simple or trivial difference, but the game ramifications are actually huge. It lets the players dictate how the game will be played. Will they fight when you thought they should talk? Talk when you thought they should fight? Ignore the challenge? Use skills? All the decisions are in the player's hands. This creates a phenomenally responsive game, but the GM still retains some creative control by determining 'consequences' for inappropriately dealing with challenges in some rare instances. Really, what game wouldn't benefit from players negotiating with the bad guys or using skills instead of a combat? The possibilities are limitless. 2. The text of the game really emphasizes the player experience in action and the story, and encourages the game master to run the story the players want. What game systems or gaming experiences inspired you to put such a heavy emphasis on the players' stories? Good question. Really I'd just say it's myself improving as a GM, writer, and person over time. When I started out (many years ago) all my adventures were pre-planned. Sometimes the players loved them, sometimes they hated them and I didn't know what to do. I would get so frustrated. I created an awesome adventure, the player's avoid it, I try to get them back on track, they resist more. I end up getting mad at them. It's a death spiral. Sometime after about 10 years of gaming it finally clicked: design adventures the player's 'want' to play rather than force them to play the ones I've created without their input. It's never failed. Initially, I would just ask my players 'what do you want to do next adventure?' then design the adventure. I've now reached the point where I can sit down and literally say, "What do you want to do today, guys?" and then whip up an adventure on the fly. The players love it. They can literally do anything, go anywhere, and meet anyone. I love it as a GM because my players are always happy and my adventures are never 'skipped'. I'll sometimes plan out adventure stuff still (everyone does) but the players feel so much in control they rarely, if ever, 'skip' the stuff I've written anymore. It's a great feeling and I think it's a great way to run a game if you're experienced enough. Also, the 'static' adventures worked great when we were younger. Go in, kill orcs, grab money. Sometimes that's all you need. As we all grew older we didn't want a 'game' so much anymore; we wanted a 'story'. This is why I'm so excited about Story Realms, it's a great idea. When I designed Challenger the concept was definitely influenced by the fact I write fantasy novels and I'm an older gamer (and person). Priorities tend to shift. You don't want a 'game' so much as a 'great story', at least, I and my older players don't. Sometimes, I admit, I still just want to bash a few orcs and grab loot, but I consistently come back to RPGs for the 'story' not the 'game'. While I've more or less quit playing a lot of games as I grew older, RPGs still remain a favorite of mine (even though I have less time to play them and actually enjoy designing them probably as much if not more). Here's another thing. Every good GM should know GMing is all about getting the players to have fun. The GM has always been an 'older/experienced' role. You don't go around trying to 'win'. You just want the players to have an awesome time. This is similar to a writer wanting the readers to enjoy the story or a game designer wanting the players of the game to enjoy it. All good GMs put the players first. Really, when the players have an awesome time, so do I. I could write the best adventure ever, but if my players don't like it I've still failed in the role of GM (no matter how brilliant I 'thought' my story/game was). Okay, I'm getting all esoteric here so I'll rest my case on this point. 3. Something I noted in reading through is a relative simplicity of rules. Despite the fact that there are 40 classes (if I counted correctly! ), they seem simple and straightforward enough that you could have a multiclassed character ready to go in minutes. Am I correct in this? How long does character creation typically take, and in your experiences so far, how has character generation in the Challenger RPG evolved from its earliest prototypes? Ha ha, I was hoping for an 'easy' question. Hm, that's a big question. Yes, I specifically made the rules simpler on each revision (Challenger is many years old now and you don't even want to know how many old copies are lying around my basement and in my hard drive). Initially, long ago, you had to roll for 200 traits for every Challenger character. It was ludicrous, it was insane, it made no sense. I had a lot of fun with it. After about a zillion very fine people (you can see their names in the credits and I tried to send them all free books when Challenger came out in print) helped me out 'a lot' no sorry "A LOT" with the game; it became simpler. What you're seeing is the product of a lot of hard work I can't completely take the credit for. Okay, yesterday I created a Challenger character on the fly (including grabbing paper an doing minor math) in about 5 minutes. For most people it would probably take closer to 10 minutes (unfamiliar with the system etc.). The biggest thing which will slow you down in Challenger is if you want to check out every single option (some people, including myself, do). Because there are literally thousands of combinations and options this will take you a very long time. I recommend for new players to just go with their gut instincts (fast) and if they want to 'power game' or read 'every single option' they may feel free to do so after they've decided if they love Challenger or not. Some people just like to have the best character and I don't think anyone should be penalized for that (but watch out if I'm the GM. Power Gaming is kind of like saying 'dead/redundant PC in my games. Probably will get a few chuckles). So yeah, instead of spending half your life coming up with the 'ultimate' character I'd just tell the Challenger GM to 'equal out' the players a bit and let them play the characters they want to. A. faster. B. simpler. C. more fun. D. no one has to worry about being 'upstaged'. However, if you want to make the 'ultimate' character, go right ahead. I've played a few pretty 'mean' characters in Challenger myself and they were a lot of fun to play. 4. "From a player’s perspective anything they can actually write down on their sheet is of added value." That's a great quote! One thing I love about Challenger from a player perspective is that there's no limit to the neat treasure you can get, and, from a GM's perspective, there's a maximum benefit you can derive on any given roll... a significant departure from most current RPG's. Can you tell us more about this? Great question. Basically, it started out as a balance issue. I've always been strong into math. In the earliest versions of Challenger I was having 'power' problems which could end up in mathematical disasters. My solution was a cap of +5 to attack rolls (not damage rolls). Inadvertently, this also allowed me to say, "GM's give away as many sweet magic items as you want, it can't imbalance the game." So far practically no-one's complained about it and some of the players just really love the sweet magic gear. It also takes the game out of the realm of numbers and puts it back into the realm of imagination which is where it ought to be anyway. Sure, your +5 sword might have an attack cap of +5 but you can still have totally awesome powers with it like magma control, cut through anything, or reverse time (at risk of paradoxes). It also allows the GM to go crazy creating sweet magic items without fear of imbalancing the game. In my old D&D RPGs this was always an issue for me. Should I let the players get this magic item even though it could combo with x bonuses with x item? In Challenger I can just say, "Yeah, go for it, on top of that: why don't we add 'this' to the magic item too?" 5. Okay, here's a big one... how does this game shine? If you were going to say "X is why Challenger is the best roleplaying game out there", what would 'X' be? Wow, that is a tough one. Hope you don't mind if I cheat a bit. 1. Free, 2. Player-created (you tell me you want it, I put it in the game, Challenger is the product of much greater minds than my own alone), 3. Faster, 4. Simpler, 5. Keeps all of the options despite being faster and simpler and, in fact, adds more, 6. play the character you want from day one, 7. get loads of sweet magic things, 8. GM's: never worry about your players skipping an adventure! 8. Players: never worry about your GM forcing you to do stuff! 9. Has sweet artwork in it I didn't even make so it's awesome (so if you hated the game it would presumably still be worth it to get it just for the art, 10. If you hate RPGs the Amazon version of Challenger has a free comic fantasy novel at the end (sweet, eh?) 11. What else could you possibly want? Okay. Write that down and send it to me via e-mail at: challenger_rpg@hotmail.com. Thanks. I hope you guys enjoyed that! 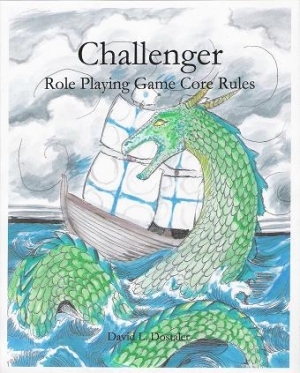 I definitely advise popping over and downloading the Challenger Roleplaying Game. It's a fun read and looks like a blast to play. 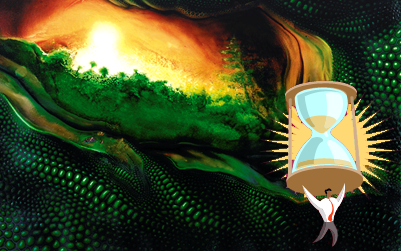 Once again it's time for the weekly Story Realms update! We said we'd update Mondays, but haven't you heard? Monday is soooo three days ago. Get with the times! These days, Thursday is the new Monday. Anyway, for our Story Realms update this week, we thought we would talk a little about the world of Storm Hollow (that’s the setting where the Story Realms game takes place) and how you get started making a character. And here...we...go! Enter a world of imagination. WOULDN’T YOU LIKE TO BE A POPPIN TOO? One of my favorite things about character creation in Story Realms is that it’s actually a part of playing the game. This is accomplished through something we call the Opening Scene. When you sit down to play for your very first time, the storyteller running the game isn’t going to start going over the details of the rules or how a skill roll works. The first thing that happens is the storyteller starts telling you a story about how you are whisked away to a strange new place. See the heroes of Storm Hollow are called Poppins. This is because they are people who simply “popped in” from a place called Earth and were imbued with amazing abilities. So the hero you will play in the story is yourself transported to magical world. The first place you show up is the palace of the Great Guardian. She is the one who will ask you if you are willing to answer the call of heroes and become a hero of Storm Hollow. If you say yes, she is certainly not going to send you out into the world as you are now. She is going to imbue you with some power. This is where the Great Guardian begins to ask the players some very important questions. WHAT TYPE OF HERO DO YOU WANT TO BE? This is the first question she asks. Choosing which character role you want to play will define what skills you are good at, determine your special powers, and help determine what magical artifact you will start the game with (everyone gets 1 artifact to start the game). Once a hero type is chosen, it cannot be chosen again by any other player. Amongst your group, your powers are always unique. There are six hero types to choose from. Lightbringers are warriors that banish even the deepest darkness from the land. They are courageous heroes that call upon the power of light to guide the way through danger. Riftwalkers are expert explorers that can navigate treacherous wilds. They learn and adapt to the strange and dangerous areas of Storm Hollow. Riftwalkers can even change the effects of the environment to suit their needs. Sparkcallers can create pure forces of magic and bring them to life as elemental pets called sparks. Sparkcallers can use sparks for various small tasks. They can also charge sparks with energy causing them to imbue friend or foe with magical effects. Stormchasers are dauntless thrillseekers that can run straight into the heart of danger and come out unscathed. They can push themselves beyond normal limits, avert magical dangers, and imbue themselves with the power of storm magic. Talespinners are masters of stories and can make epic tales come true. They sense lore about people and can hear the stories echoing from important objects. The words of talespinners hold such power that with the right tale they can actually make themselves or their friends more powerful. Whizbangers are brilliant inventors who can create handy contraptions and gadgets for any situation. They carry lots of gear and if they don’t have the right tool for the job they can make a small automaton called a chug to do the job for them. After the players all choose what type of hero they want to be, the Great Guardian will ask you the next important question. The Great Guardian will ask you to choose a talent that you believe you have within you. The Guardian will give power to this talent and you will thrive when you use it. What this amount to in the game is that when you act according to your talent, you get to roll a special die on any skill roll that increases your chance of success and can earn you boost tokens which are used to increase skill rolls and activate your best special power. 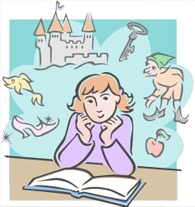 Every talent is also associated with one of the six magical elements. You get to roll your talent die when you try to manipulate that type of magic (in Story Realms magic is just a skill so anyone can try to do magic). Talents are the games way of encouraging players to really play their characters. It’s a small but important reward drawing the player to act in character. Again, once a talent is chosen it cannot be picked by anyone else. Your talent is uniquely yours. There are six talents to choose from. Add your talent die when you try to search for clues, get information from someone or use water magic. Add your talent die when you distract someone, make a really big or really noisy effect, or use fire magic. Add your talent die when you aid someone else in their effort, make a team skill roll, or use life magic. Add your talent die when you guard an ally, prepare for danger, or use earth magic. Add your talent when you play a trick, try to pass yourself off as someone you are not or use wind magic. Add your talent die when you charge into danger, do something strange and unpredicatable, or use storm magic. After you’ve chosen what type of hero you want to be and called out a talent, you get a unique artifact based on your hero type and talent. You also then get to pick an adventuring kit which is kind of like your regular equipment. However, you get to pick a new kit at the start of each adventure so it’s not exactly a part of character creation. We will go into detail about kits and how they work later. 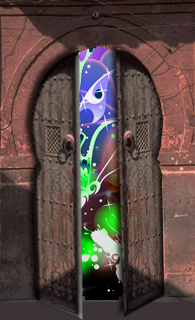 After the Great Guardian has imbued you with powerful gifts, you walk through a magical door and find yourself somewhere in Storm Hollow. Right through this door if you please! Storm Hollow is a storybook world filled with high fantasy and new twists on many classic legends and folklore. Magical lightning storms sweep through this valley regularly imbuing the land with magic. Sometimes these storms open great rifts that remove parts of Storm Hollow and drag in pieces of other words. Currently, there are twenty different rifts in Storm Hollow each with their own strange and unique scenery. As the players continue to adventure, they will learn that they are not the first Poppins to arrive in Storm Hollow. Indeed, many of the legends told on Earth are of adventures that took place here. Alice Liddell is a hero to this land and her romp through Wonderland may have indeed been a grand adventure in the Wierding Wilds of Storm Hollow. There are canyons left behind by the foot falls of the great giant that pursued Jack of Tales down his beanstalk, and Kintaro, Japan’s legendary golden boy, once defended the rifts of this world from powerful forces of darkness. For in Storm Hollow, the darkness is a palpable force of evil. Every shadow the day can cast and every patch of darkness laying under a moonlit sky could be home to a Dark Door. These actual doors lying upon the ground, hidden in shadow lead to a place where vile monsters creep and powerful Night Haunts lurk. They wait in the darkness plotting with their terrible minds fixated on the day they will open the doors and turn the world of Storm Hollow into a living nightmare. Heroes have always come to keep this darkness at bay. As you walk through that door in the Guardian's Palace, it falls to you rise against it once more. Host Your Own Mini Game Con For Your Friends! Throwing a game party can mean a lot of different things. You might throw a regular party themed after a favorite game. You might throw a party and plan to play a lot of large party games that accommodate all the guests at once. However, one of the most fun game parties is the game party where you get multiple tables running a variety of games all at once. This lets your guests play a bunch of different board and card games all night. It can be tough to do well because you’re essentially trying to throw one whole party that includes a lot of little gatherings. Different games will get over with at different times and you want to keep people flowing from game to game while having time to mingle and have a good time. The multi-table game party can be tricky, but very rewarding when it works. It’s kind of like your very own mini game convention where you and your guests get to enjoy a lot of game playing fun in a very short amount of time. Here are 5 tips to help you pull it off. You know what‘s happening at this party. You know it’s also a party where you want to break guests up into smaller groups to play a bunch of different games. This is very different than a traditional party that usually just encourages mingling or plans activities for the whole group. It may not be the right cup of tea for everyone you know. Be clear when you are inviting people and take care who you invite. Your non-gamer friends may be excited to show up to a party you’re throwing and then get bored and disinterested when “everyone is just playing board games”. This can pull away from the flow of the party and ruin the fun for everyone. Make sure you are clear about what type of party this really is and try to invite the people you know will have fun with it. A party is a party regardless of what theme or activity you’ve picked. Game parties are no different. They still need the basics. Clean your house, arrange the furniture for maximum space, put up some decorations if you got them, and above all, have lots of food. Food should be abundant at a party so the guests have something to do and something to gather around when they aren’t directly involved in a game or activity. Food provides both entertainment and energy to keep going all night. 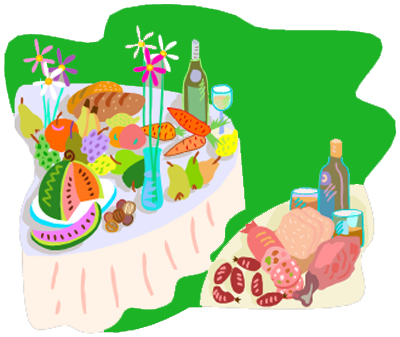 If the food starts to dwindle, you may find your party dwindling right along with it. Guests won’t say that’s why they’re leaving. Heck, they might not even think that’s why they’re leaving. They’ll simply find that’s its getting a bit late or they are getting a bit tired when some more chips and salsa and another crab cake would have tempted them into staying. It will be tempting to sit down as soon as a few guests arrive and jump into playing a game as soon as possible. After all you want to play some games. You went to all the trouble of throwing this party and everything, right? You need to resist this urge for an hour or so if you can. You need to make guests feel welcome. Greet them when they arrive. Direct them toward the food and give them the lay of the land. Tell them what the current games are that are being played and find them something to join in on. If you can resist jumping into a game you’ll be better able to help get the party going. If you absolutely can’t resist (I know I certainly have trouble with this) then at least make sure you are in a central location and that you are playing a game you can walk away from for a few minutes at a time when you need to greet new guests. After the party gets going, don’t get so caught up in a game that you’re not available to help organize the next round of playing if you need to. Remember, you need to keep things flowing from game to game. So the guests will just show up and you’ll be like, “Hey, what sounds like fun to play?” They’ll pick something out from your impressively vast game collection and the party will just get underway. Perfect right? WRONG! You need to plan a main event. It’s all well and good to try and get multiple tables with various games going eventually, but when guests walk through the door you want to say “Hey guys! Are you ready to play this game? It’s gonna be a lot of fun.” You absolutely do NOT want to engage in the “so what do you feel like playing?” discussion. You’re trying to throw a party not waste the first hour trying to get your guests to plan the party for you. 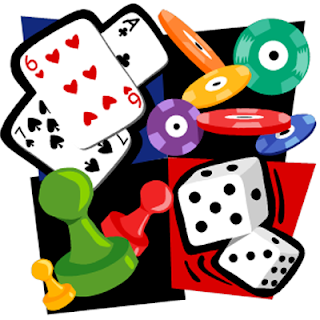 The best games for main events are game you can easily get going at a few different tables. Games you can get multiple copies of to play or games that have enough pieces to accommodate multiple games are good choices. For example, if you have enough boxes of Dominion for a few games or if your players are fond of Magic the Gathering, these are games that can work across a few tables. Beyond the game you want to be the main event, you’ll of course want to have some tables with alternate games. If you have an extensive game collection its best to put out a limited selection of games you think would be fun to play and not overwhelm guests with too many choices. Games that play in under an hour are most optimal. Guests will have more fun if they get a chance to play lots of games instead of getting locked down into one 4 hours epic challenge that ends up being the only game they play that night. Above all, guests will have fun in they spend most of their time actually playing some games instead of wasting half the party talking about what they should play. A good game party, like any party, needs to provide the opportunity to meet with other guests and talk to different people. As games finish up, make sure you take the time to organize people into the next game to keep things moving. When you do this, try and mix up who is playing with who. This can be tough. Convincing people to leave the table they are at and go sit down with new people may take some effort. Don’t be too pushy towards people that want to stay together, but encourage those that are willing to try mixing it up. This way people can make new friends and enjoy different play experiences. Well that’s just a few tips on how to get this type of party going. If you’ve got any great advice or experience throwing a great game party, leave a comment and let us know what’s worked for you. This week were answering some questions about Story Realms design and development from David Dostaler, designer of the free downloadable Challenger RPG. David had some great questions about our system, mechanics, development, and playtesting so we thought it would be fun to answer them here and share with our readers too. If you have any questions for us, feel free to send them in!! Who's your publisher and how do they operate? Do you have a certain amount of copies planned for print. Marketing strategies? Retail outlets? We have a really great group of talented individuals working on developing and producing Story Realms. Our game studio, Escapade Games, has teamed up with Game Salute and we will be working together to make sure the game reaches its full potential. We’ll be running a Springboard-Approved Kickstarter campaign later this summer to raise funds for the first print run and gauge interest in the game, and our success at that will have a large impact on the initial printing. Game Salute has a lot of experience and expertise in organizing, managing, promoting, and marketing game projects as well as warehousing, fulfillment, customer service, and retail distribution, so we trust them to figure all of that stuff out while we focus on final design, development and playtesting of the game. With this arrangement, we all get to focus on what we do best and provide the best quality, value, and fun game for the customer! Teamwork is an equation for success!! Story Realms feels to me like a game that's more story orientated than 'crunch and number' orientated. As a very 'open' system (I presume) how do you plan to handle playtesting? If the game is primarily story based, do you want to get feedback on how the game mechanics effect story? or would you rather still have feedback on 'crunchy' elements of the game? Perhaps both? As we worked on developing Story Realms one of our biggest considerations was building mechanics that facilitated good storytelling. Our thought was always that if we did our job right, the game would feel very open and story driven, while having a solid mechanical foundation that keeps the game moving along and provides dramatic tension and memorable heroic moments. A good story has highs and lows, accomplishments and setbacks, and revolves around the interaction between the characters and the setting. Story Realms is definitely not a “crunch and number” oriented system, but there are concrete mechanics that enable fun roleplaying adventures. Our goal is for the mechanics to fade to the background as the story unfolds and to provide a simple organic system that is easy to learn while still maintaining interesting emergent gameplay. In Story Realms, you shouldn’t ever have to spend time thinking about HOW to do the action you want, you should be able to think of a great idea or an interesting plan and be able to have a good chance of pulling it off. It’s all about creating a great story and expressing creativity, and our character powers and artifacts are designed to provide fun options, not to limit the types of thing you can do. 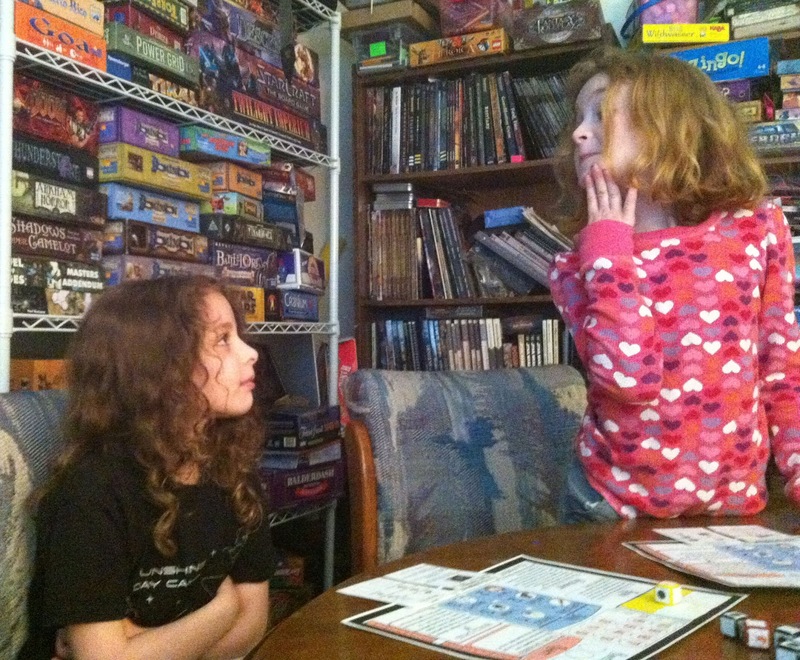 Katie and Sabine dreaming up with a clever plan while playing Story Realms! When we move into the beta playtesting phase of the game we absolutely want feedback on both how the game mechanics affect the story, and how well the “crunchy” elements are doing their job of facilitating a fun experience. We also want feedback on the premade adventures we’re including with the game, and especially the toolbox we’re providing for creating and playing your own epic adventure stories. My instinct was that Story Realms was designed to be played fast and loose (1 hour) and also was geared towards younger aged players (could be wrong, please let me know). If this is the case, what age groups are your primary targets? Will the system be adaptable to be interesting for 'older' players? If the game is targeted at a slightly younger market, do you have a plan to break in against computer and video games and other things that kids are doing nowadays? Will the younger players be able to easily understand the rules interface and get playing right away? (most RPGs have a pretty steep learning curve, but it's worth it). Story Realms is designed to play in about an hour because that is the amount of time we thought is reasonable for a family to sit down and play a game together. Story Realms is not exactly designed for a younger audience in particular, its designed to be playable and enjoyable by people of all ages. We created a set of physical components that track and display all of the game state information to make it easier for young players and people unfamiliar with tabletop roleplaying games to be able to jump in and have fun without the need to learn complex rules, remember lots of different interlocking rules, and perform pen and paper bookkeeping tasks. Story Realms character creation consists of a few interesting choices that determine how you want to play the game. Players then have a pre-printed character sheets with cards that represent their choices that slot onto the sheet to display all of the rules needed to start playing. As the game progresses, more elmenets are added in, so the players have a natural learning progression that unfolds during play. The players shouldnt have to read any rules or sit through a long-winded explanation before jumping right into the action. We definitely took our youngest players into consideration heavily as we developed the different elements of the game, but we also took into consideration older children, non-gamers, and gamers as we fleshed out our mechanics and our world. At this point, our youngest playtester was a non-reading 5 year old kindergardener, and our oldest playtester was an 80 year old grandmother playing with her adult grandkids and a great-grandchild! We've played the game with a non-gaming mom and two 6 year old girls, a group of 30-something "gamer" guys, and many other ranges and group configurations. What we've found across the board is that there is something for everyone to enjoy in this system and in our world. It's simple enough for anyone to jump right in and play, but there's enough detail and richness to the world to surprise and delight even veteran roleplayers. Story Realms offers a memoerable and reasonbly short epic experience that people enjoy playing together, and i think the game isn't looking to compete with video games or other activities, just to slot in as a fun way to experience a unique story together with friends or family. Assuming that Story Realms de-emphasizes the rules side of things to focus on the story (I'm doing a lot of assuming here) do you have a plan to handle the 'power gamers?'. In most groups I've had the pleasure to game with there's always at least one guy who just wants to number crunch and kill stuff (Yes, it's annoying, but they tend to crop up). Due to the way character creation, advancement, and challenges are handled in Story Realms, I don’t really think there’s a lot of opportunity for “power gamers” interested in min-maxing mechanics to get the number crunching fix or find unbalanced combinations of powers. More specifically, the rules provide a structure for heroic adventure without a lot of opportunity to “break” the game. 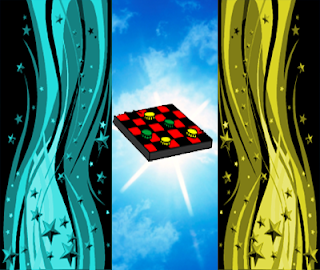 This game rewards creativity and problem solving in unique and memorable ways. At the heart our system is very simple, and many different effects can have the same mechanical result. We’ve abstracted a lot of the complicated elements of traditional pen and paper roleplaying games into a very streamlined and efficient system in which successful actions by the players usually results in one of four things; it reveals new information, moves a progress marker on a track towards the current goal, avoids negative effects, or reduces the threat level of an encounter. However, that doesn't mean that there is nothing for a "power gamer" to enjoy in Story Realms. As characters progress they will acquire more powers and artifacts that they can equip at any one time, so the players will have a chance to play around with different combinations of abilities that best suits their preferred play style and try out new options each game. Additionally, our system provides visible trackers of the heroes progress, and there are a lot of ways that character powers can directly interact with these elements. Gamers that enjoy the crunchy mechanics of a game will have all the information available to them to make strategic decisions and manipulate these elements in tactical ways, but the system is integrated enough into the narrative that players that don't want to worry about that don't have to. I think one of the biggest strengths of our game is that you really don't HAVE to spend time thinking about optimal plays. Many power gamers really just want their characters to be effective and have a cool set of abilities that feel special and interesting. We designed our character roles so that each character option provides a completely different way to interact with game elements and components, and every character has a chance to do epic and heroic tasks in a flavorful and fun way without jumping through complex hoops while making a character. Do you have a plan for the 'core mechanic?' or perhaps no core mechanic at all? (pure story). If you 'do' have a plan for some kind of mechanic to resolve actions, what form would that take 'roughly'? Story Realms has a very important core mechanic that helps create interesting tension and move the game forward. All the actions a player can take are quantified into 6 simple skills: Move, Might, Magic, Think, Talk, or Explore. A player can do whatever action they can think of, and then makes a skill check using the most relevant skill. The player rolls a number of dice equal to their rating in that skill, and rolling at least one hit (50-50 chance per die) equals success. 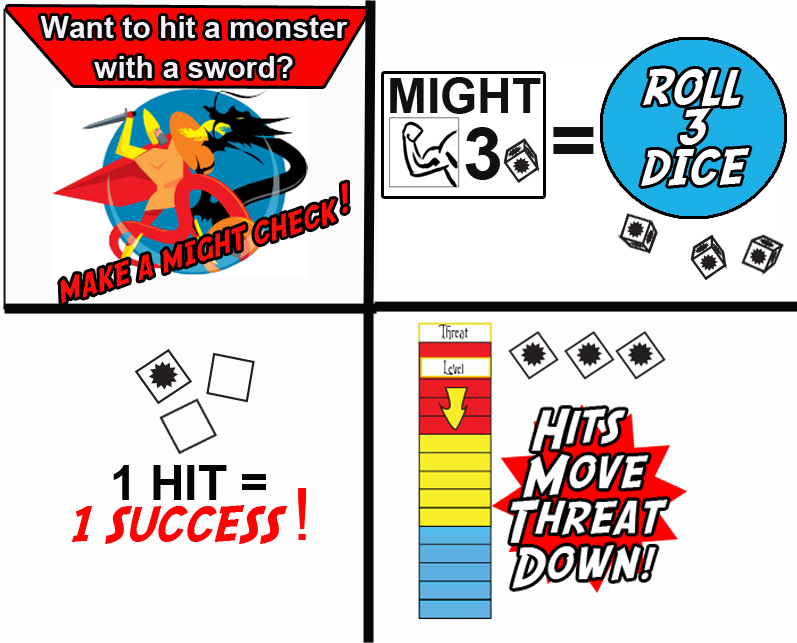 We build upon this mechanic throughout the game by including some checks in which the number of hits you get matters. We made the likelihood of success high, because we want the heroes to be able to accomplish their plans, but misses come up often enough to make for good tension. Success on a skill roll means that something positive will happen for the players. For example, in a combat action challenge hits rolled on the dice cause the Threat Meter to move down which affects the way the creatures in the challenge act and determines the final outcome of the battle. We don't track specific things like individual monster hit points, and the Storyteller doesn't roll any dice. Instead we created a fluid system where the players can do anything they can imagine and we provide a clear way for the rules to handle clever ideas and reward creativity. In order to keep skills reasonable throughout the game, we decided that they don’t advance. So if you start with a 2 Move check, you’ll always have a 2 Move check. However, certain other factors can influence that. Having the right tool for a job (like perhaps a walking stick while climbing a steep slope) will give you +1 die to the check. Additionally, at the beginning of the game each player selects a unique talent which describes how they want to interact with the other players and the world. The talent choices are Curious, Helpful, Protective, Wild, Flashy, and Tricky. Whenever a player describes an action in a way that exemplifies their talent, they get to roll their unique talent die in addition to the regular skill roll. This die has 2 regular hit faces, and 2 additional hit faces that grant the player a “boost”. Boosts can be spent to add hits to successful rolls or to activate unique class powers. The player talent and skills system works together to reward players for playing out the character choices they made, and is very intuitive and simple to play. Each talent has specific types of actions mapped to it to provide a framework for when players can add their talent die, but it’s ultimately up to the Storyteller and the players to come up with fun uses for the talent die. With each system we wanted to provide a simple core mechanic with very clear applications, and still allow creative interpretations and judgment calls for what is best for the story. We don’t want the Storyteller to have to be an expert game master to be able to run a fun game of Story Realms, so we made sure that the rules provide clear direction on how player actions resolve while providing enough flexibility to tell whatever kinds of stories you can imagine. What's really cool about Story Realms that's never been done before. I.e. what's the 'brilliant' idea that got you started? I think we’re really breaking a lot of new ground with Story Realms, but we’re also building on a lot of past successes. This is a big question, and could really be a post in itself. As a matter of fact, its been something we've been talking about a lot in recent updates. A couple weeks ago we discussed how we came up with the idea for the game, and we’ll be expanding on a lot of the mechanical and flavor aspects of the game in upcoming posts. One thing I'm really proud of is that we were able to slim down and simplify traditional roleplaying game elements to their core to make a game that encourages creativity instead of limiting it. We had a specific experience in mind that guided our design and development of the game, and that is to feel like you've participated in a heroic fantasy adventure and have a memorable story to tell after about an hour of gameplay. In order to accomplish this goal we've looked at and talked about all sorts of options, and selected the ideas that reinforced the essential experience we wanted to create. We pulled inspiration from various sources, including board games, roleplaying games, and video games to create beautiful and functional components that provide a tangible physical interface and facilitate great story-based experiences. The game components serve to convey information to the players in a concrete and visual way while serving as useful tools for the Storyteller so they can focus on the exciting parts of weaving an exciting story. 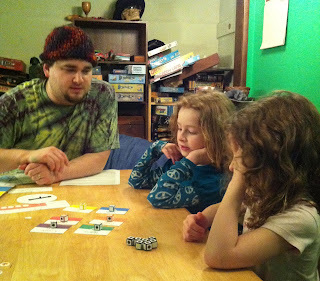 Family fun playing Story Realms!! Well thanks for hanging in there throughout this lengthy post, and thanks to David for all the great questions! Let us know if there's anything else you'd like to know about Story Realms. We've got plans to show a lot more detail about our mechanics, our world, and the rules for Story realms. Additionally, if you're going out to any of the big conventions this summer (starting with Origins this month!!! ), be sure to stop by Game Salute's Tabletop Arcade and give the Story Realms demo a try. We'd love to hear what you think of it!! Story Realms Weekly Update: Game Break! Although we've been steadily plugging along at Story Realms development, we don't have much new to report today (although we do have some very exciting stuff coming up really soon!!)... so we thought we'd just do a quick show and tell about the fun stuff we did this week instead! This week we celebrated birthdays, played video games at a vintage retro arcade, built and drafted a MTG cube for the first time, busted open and played with lots of Avacyn Restored boosters, and enjoyed several days of merriment and gaming goodness. Drafting the brand new Mulitcolor Multiplayer Legendary Fun Cube for the first time! We firmly believe that playing games is an important step in designing and developing great games, so we've made it a priority to make sure we're always taking time to play and have fun. This week we spent a ton of time deciding how to build a limited environment for Magic the Gathering that would suit our group's favorite play style and allow for some super fun interesting games. We wanted a heavily multicolored set, with a focus on legendary creatures and mutliplayer madness. We basically wanted to recreate the fun we have playing Commander (big creatures and spells, fun legends, lots of multicolored decks) but while playing with some new cards, combos, and experiencing some drafting and deckbuilding goodness. The first draft and play with the new cube went really well, and we're looking forward to many more!! It was the first time drafting for some of us, which was a whole new experience unto itself! The cube definitely a work in progress, and if there's interest we'd be happy to share the cube list and get any feedback or ideas. Let us know! Cracking open Avacyn Restored booster packs and doing a fun sealed draft. 45 packs opened and lots of card slinging! We also hosted a booster pack sealed deck celebration of the new Magic set: Avacyn Restored! The experience was really fun, and we even got a couple of new players to join in the fun. My favorite part of it was watching a friend new to Magic build her first deck and get excited to try out some of the new cards (and she beat me in our duel!) The best cards we saw opened were Griselbrand and a Cavern of Souls, and I'm personally very excited about Primal Surge. Little Jack was pretty bummed there wasn't and "Avacyn, Angel of Hope" in out packs, but I'm still hoping we'll get one! I've never seen my kids so excited about a specific Magic card or personality, but they are both VERY stoked about Avacyn! What games did you play this week??? Hello folks and welcome to the weekly update for Story Realms. As it has been going, “update” is a bit of a misnomer for these posts. We should probably start calling them design diaries or something like that. Our game is still deep in the process of development and we are working hard to get things ready to show, but at the moment we don’t have much in the way of news to offer. What we can offer is some insight into the game itself and our thoughts behind why we made it the way we made it. Story Realms has a few design specifications that we decided were core to the experience. These are “laws” of the game that we do our best never to break. One of the most important decisions we made for this game is that we wanted a gaming group to be able to go on a full adventure in about an hour. Grand adventure in just one hour? Can it be done? I love a good marathon gaming session as much as the next game fanatic, but as gamers who are now working and raising families know, it can be really hard to find the time to play a really long game. When you do clear out the time, shorter games still tend to sound more appealing because you can play say 6 or 7 games of Dominion in the same amount of time you can play 1 epic game of Through the Ages. I love that civilization building game, but seriously, when do I have the time? If you’re a fan of role-playing games, you know this problem well. Your average Dungeons & Dragons game takes at least 4 hours to have a satisfying session and it can often take 3 or 4 of these sessions to finish off just one dungeon or one storyline. If you want to get together to make characters, this process can take several hours before you even start the game. That’s why most adults who want to carry on playing their favorite RPG often have to carve out a weekly or biweekly game night that all the players in the game commit to and are willing to arrange their lives around to some degree. It can take quite a commitment, but role-players do it because they love the games that much. Still, if you didn’t get hooked on RPGs in your youth, this kind of commitment can be a real barrier to entry if you’re not even sure you’ll like the game. For all these reasons and more, it became important for us to design Story Realms so that each adventure you would go on would take about an hour. An hour is something you can squeeze in and still do something else that night. An hour is a reasonable commitment to ask your reluctant family members to make to try something they’re not sure they’ll like. However, a short game wasn’t good enough on its own. We didn’t want to shorten the gameplay by chopping up a story into a bunch of tiny pieces or by making the adventures small in scale. We wanted Story Realms to deliver a COMPLETE adventure EVERY time you sit down play. An opening scene to set up a story, some journeying or mystery solving, and a big climactic scene to bring the adventure to a close. Cutting a grand adventure down to shorter than a movie while keeping the fun and action intact was not an easy task. It took a lot of testing and retesting ideas, but always we returned to the principle that getting this thing down to about an hour was incredibly important. Do you really want to solve this one turn at a time? For me, when thinking about this idea, I thought about the movie Labyrinth (a particular favorite movie amongst the Growing Up Gamers crew). Early on in the movie Labyrinth the hero, Sarah, sees the entire maze off in the distance and it looks like miles and miles of passages and corridors. By the end of the movie, the audience very much feels that Sarah has journeyed through that maze of corridors, overcome many challenges, and solved the Labyrinth. However, the movie doesn’t really show her doing it. At least, it doesn’t show every step of the way. Instead, it has a few shots and quick cuts of her considering which direction to go and then jumps to the scene where she encounters the next interesting character or worthwhile problem the Labyrinth presents. Thinking about this and other stories we loved made us realize that a lot of adventure games have an incredible amount of filler. 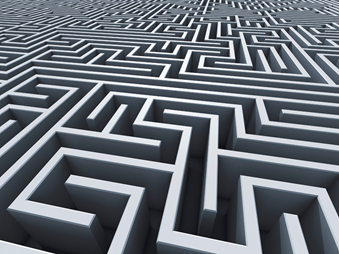 In Dungeons and Dragons, this Labyrinth adventure would be handled entirely differently. There would be a map of the entire Labyrinth and generally, the players would wander down each corridor picking left, right or straight and spend hours mostly seeing a lot of nothing while encountering the occasional minor trap or monster meant to fill the space. This is the common temptation because when the player is the character in the story it feels like there should never be a cut in the scene. After all, if the players were really there wouldn’t they actually have to navigate each corridor? If you describe them entering the Labyrinth and then jump to a scene halfway through the maze, aren’t you cheating them of the storytelling agency they are supposed to have? The answer is, no. You’re just making them wander a lot of corridors. No other storytelling medium does this. Television and movies do not ask the audience to watch the hero walk across the countryside. Even books which are a much longer format for telling stories don’t fill their pages with countless details of what equipment the heroes purchased or prepared before heading out on every single quest or what the scenery looked like when the hero road his horse to the next town. Most storytelling mediums break the story down into scenes and, just like the movie Labyrinth, they fill those scenes only with the exciting moments that really push the story forward. For Story Realms, we thought, why try to reinvent the wheel? Let’s make the wheel turn for us. We decided to break it each adventure down scene by scene and set a limit. 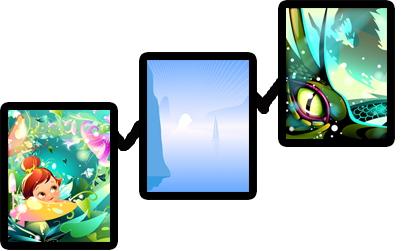 An adventure in Story Realms is played across three scenes. Usually, there is a scene to set up the adventure, a scene to show the heroes journey towards the goal, and a final scene to show the big, climactic finish. To accomplish this, we had to cut out a lot of waste. No unimportant side quests, random encounters, or filler rooms to make a place feel big by using up time. This has the benefit of always keeping the game on the most interesting parts of the story and never burning up play time with repetitive mundane tasks like searching corridor number 37 to find another small room with nothing in it. At one point we were worried that slimming an adventure down to three scenes would make it feel like the quest was “on rails”. Would the players feel as though we had taken away their choices? After playtesting numerous times, it became obvious that this would not be a problem. While we removed the illusion of choice to go in any direction you wanted, we replaced it with much more freedom for the players about how a scene plays out. I say the illusion of choice because while a D&D adventure will let the players choose to go off in any random direction, it doesn’t really accommodate that choice well. The Dungeon Master has an adventure in mind and if the players try to chuck that adventure to the wind and set off on entirely their own task, the adventure tends to go right off the rails with them and quickly crashes to a halt. The fun choices are not about whether you go on the grand quest, but HOW you go about accomplishing it. This is where Story Realms shines. The rules are designed to be flexible and allow for just about any creative choice a player can think of to try out to solve the challenges presented in each scene. One scene in our opening adventure involves the straightforward task of getting to the bottom of a waterfall (well there’s a bit more going on in that scene, but the basic task is descending the cliff where the waterfall flows). We have had players climb down with ropes, build flying machines, glide down on wings and freeze the waterfall and use magic to fashion it into a zigzagging ice slide. None of these were predetermined options written into the adventure. They were all just different ways players thought of to get down a cliff. This is what we are aiming to keep the focus of the game on in Story Realms. Allowing each player to use their heroes powers and skill as creatively as they can to solve the big challenges and play out the meaningful and exciting parts of each adventure they go on. That is how we let the players experience epic quest after epic quest in about an hour each. The heroes are always running away from “the cleaners”, escaping the bowels of the oubliette, fighting the goblin hordes in the goblin city, and confronting the wicked goblin king in the room of Escher-like staircases. They are never simply wandering corridor after corridor of the endless Labyrinth. Of course, the scene structure isn’t the only thing that helps keep the play time down. Our challenge/combat system is an important factor in that as well. But that’s a story for another time.